Some conditions are more common in certain breeds but any condition may occur in any breed. 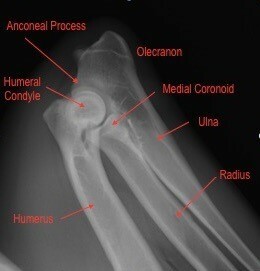 The above X-ray shows a normal elbow of a dog to illustrate the different bones and parts of the bone that make up the elbow. If the radius grows more slowly than the elbow it becomes shorter and this puts increased pressure on the medial coronoid process of the ulna. “Process” in this context means a pointy piece of bone protruding from the main bone. Directly translated the medial coronoid process is the “inside crown pointy bone”. With the ulna being longer than the radius this can cause cartilage damage in the joint and sometimes the tip of the coronoid process may fracture or break. This is referred to as the fragmented medial coronoid process. Labradors, Rottweilers and Boerboels are the most commonly affected breeds but it can occur in any breed. If the ulna grows too slowly then the radius pushes the humerus (upper arm bone) against the anconeal process of the ulna. The anconeal process looks almost like the beak of a bird. If the radius grows too long, it puts pressure on this section of bone or “beak”, which prevents it from growing and maturing properly and may lead to the anconeal process being unable to unite or attach properly to the rest of the upper part of the ulna bone (called the olecranon). This ends up being like a “bird with a loose beak”, and needless to say is very uncomfortable and painful for the dog. The ununited anconeal process occurs commonly in German Shepherds and Boerboels. If the radius and ulna do not grow at the same rate of speed, a condition called elbow incongruity can occur. This causes wear and tear on the cartilage, as the humerus does not meet the appropriate surfaces on the radius and ulna. Thus, some points of contact are overloaded and this can lead to fragmentation of the medial coronoid process and other abnormalities. Cartilage is the protective layer that is formed over the bone within joints. Cartilage helps lubricate the joint and reduces friction within the joint. Osteochondrosis is a condition where there is an abnormality of the cartilage and the bone underneath it. Osteochondrosis most commonly occurs in the inside part of the upper arm bone or the medial condyle of the humerus of the elbow joint. Osteochondrosis dissecans (OCD) describes the condition where a flap of cartilage forms. This flap may stay attached or break off and float around in the joint. It is usually very painful. It is commonly seen in Labrador Retrievers suffering from elbow dysplasia. Elbow dysplasia can affect one or both elbows. No matter which condition is present, the clinical signs are generally the same. 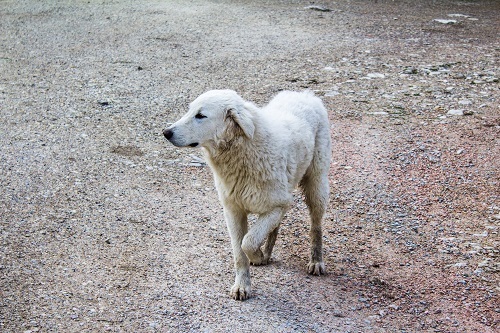 Most commonly, dogs show lameness on one or both elbows, particularly after resting and lying down. They may be reluctant to exercise and may struggle walking up and down stairs. Elbow dysplasia can present as early as five months, but signs are commonly seen in large and giant breed dogs between six to ten months. In some cases, elbow dysplasia may only be diagnosed when the dog is much older and the joint has become arthritic. The lameness is often worse after exercise and often will not resolve completely. An orthopaedic examination in most cases reveals pain and occasionally swelling of the elbow with a restricted range of movement of the joint. Movement is reduced due to arthritis developing in the abnormal joint. Elbow dysplasia is diagnosed by a combination of a thorough clinical exam and diagnostic imaging. X-rays are generally the first diagnostic step in diagnosing elbow dysplasia. Certain conditions such as an ununited anconeal process are generally quite easy to visualise but other conditions may need further diagnostics such as a CT (X-ray computed tomography or CAT scan) or arthroscopy. Arthroscopy is keyhole surgery where a small camera is placed within the joint to visualise it. It is minimally invasive and, in some conditions, the joint is operated on at the same time. The treatment undertaken depends on a number of factors. Age, clinical signs and degree of arthritis in the joint are all deciding factors. It is not possible to reverse the damage that has already been done to the joint, but the progression of the disease can be slowed. All dogs with elbow dysplasia will develop a certain degree of arthritis, even if they undergo surgery and so this should be taken into consideration beforehand. Surgery by a specialist surgeon vet may be recommended to help correct a step in the joint (elbow incongruity), remove any fragments of bone or cartilage, or to surgically alter the joint (arthrotomy). Many dogs may be managed medically or conservatively, particularly if the changes within the joint are minimal. Strict weight control, which helps reduce the stress on not only the elbows but all the joints. Controlling exercise is also an important factor, ensuring that exercise with lots of concussive forces, such as jumping for a frisbee are kept to a minimum. Controlled leash walks and swimming are examples of low impact exercise. Hydrotherapy (controlled swimming exercises) works the muscles without putting extra strain on the joints and is also beneficial in controlling the weight. A veterinary prescription diet for the management of the joint disease or joint supplements has also been found to be beneficial. Omega-3s, chondroitin and glucosamine which are substances which feed the cartilage all help nourish the joint and can slow the progression of arthritis. Medications such as anti-inflammatories and other pain medications may be required daily to control pain and inflammation, but other cases only require them occasionally. Elbow dysplasia is most common in large and giant breed dogs but can occur in any breed of dog. There does appear to be a genetic component to elbow dysplasia and breeds such as Labradors, Golden Retrievers, Rottweilers and German Shepherds have been overrepresented. It is possible to have elbows graded and scored and it is advisable that dogs showing signs of elbow dysplasia are not bred with. This is done by X-ray under general anaesthesia after which the X-rays are sent to a specialist radiologist vet who does the analysis and scoring. Elbow dysplasia can be managed both medically and surgically, but it depends on the symptoms and syndrome present. A lot of dogs will be able to function very well however the long-term prognosis is guarded as most if not all of them will succumb to degenerative joint disease and arthritis in the affected joints.